Intended for moderate flows, SilverCare Organic Cotton Applicator Tampons absorb the menstrual flow while respecting your flora intimate. They have a protective veil that covers the absorbent heart in organic cotton. This protection allows the fibers to not adhere to the inside of the female body when removing the tampon. They assure you protection and softness during your menstruation. These organic tampons with applicator are practical to insert thanks to their rounded tip. They are easy to carry and slip into the purse thanks to their individual packaging. 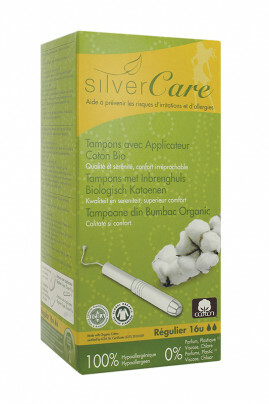 No more irritations and allergies with TSilverCare Organic Cotton Applicator Tampons ! Using the applicator, insert it as a classic pad. SilverCare Buffers have a natural and organic composition! Absorbent heart 100% organic cotton, without viscose nor rayon (artificial silk)! Cotton drawstring sewn with absorbent core. Carton applicator in biodegradable cardboard.